Have you ever felt what it’s like to reel in an 8 lb. trout? Now’s your chance!! Our private Catch 'n Release Trophy Trout Stream is located in the log cabin area of the Resort and runs under the covered bridge. 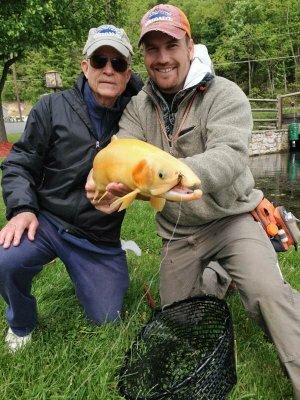 These beautiful rainbow, brook, golden and brown monster trout can range from anywhere between 2 to 10 lbs. Some of the trout in this area are around a decade old. Stop by to feed and admire them, or call a Smoke Hole Outfitter guide to make an appointment to throw in your line and catch a brooder!! Small children beware...we must tie you off with a safety rope. Juuuuuust kidding!! But seriously, you'll definitely want to have your camera ready!! We charge per half hour, half day or full day. Please call for pricing and to make an appointment. Do I need a fishing license for the stream? Yes. DNR law requires anyone over the age of 14 to have a valid West Virginia fishing license, as well as a trout stamp. Licenses are sold at the Smoke Hole Resort Gift Shop. We are not to be held responsible if you are caught fishing without a valid license by DNR. Do we have to fish with a guide? Yes. These are very large trout, sometimes making it very difficult to put your hands around them. Some of these trout have been in our care for over 9 years. We want to make sure they are well taken care of as they are reeled in, the hooks are taken out of their lips, and they are properly released back into the stream. A Smoke Hole Outfitter guide must be with every Catch ‘n Release customer. No exceptions! What kind of tackle can we use? You may use a fly rod or spinning rod of your choice. Line size should be 6 to 10 lb. test. We use artificial lures with single hooks only. Absolutely no treble hooks. We will provide the nets. Fly rods should be 4 or 5 wt. If you would like to bring your own flies and have questions on what might be hatching, please feel free to call us prior to your appointment. We do have fly rods and spinning rods available for use.